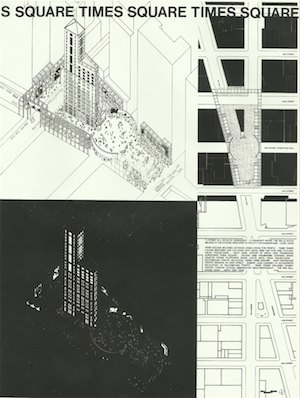 The Times Tower Site Competition grew directly out of the widespread negative reaction to the monumentality and monotony of the first Johnson and Burgee design for Times Square Center, which also proposed to demolish the remains of the original Times Tower to serve as an open forecourt for their ensemble. 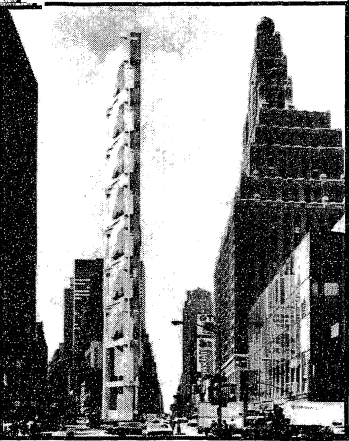 In fact, no vestige remained of the original Times Tower, save for its steel skeleton. 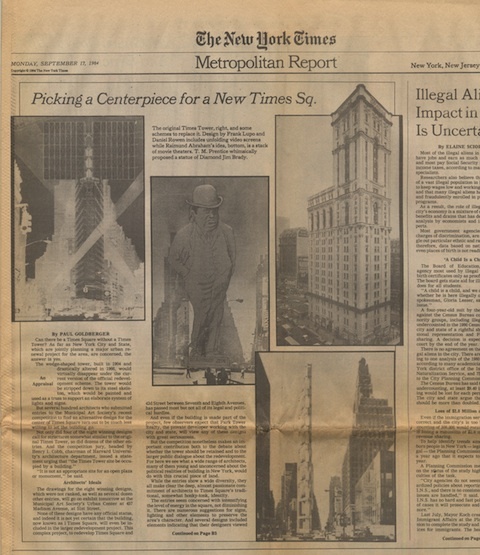 Its extravagant terra cotta ornament had been stripped off in a 1964 modernization for Allied Chemical and replaced with expanses of white marble and thin gray glass windows. 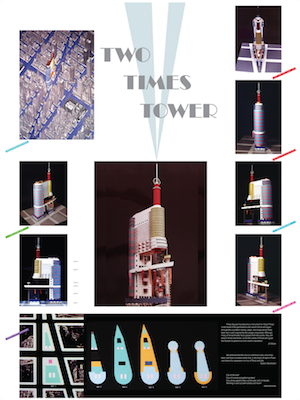 By 1984, new owners were beginning to exploit the small tower's highest potential, not as rental floor space, but as a highly visible vertical surface for ads. 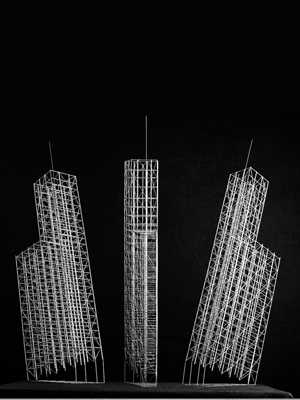 Nevertheless, the 42DP had agreed to allow the tower to be demolished as part of the package of the full development site. 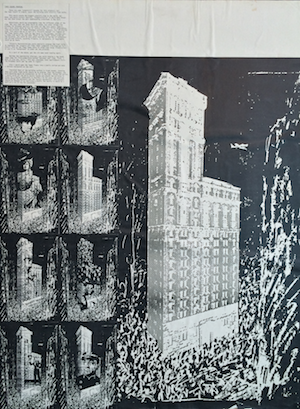 In March 1984, the civic organization The Municipal Arts Society, in partnership with the National Endowment for the Arts (NEA), organized an "ideas competition" for alternative proposals for the site, which was officially announced by the poster (above). 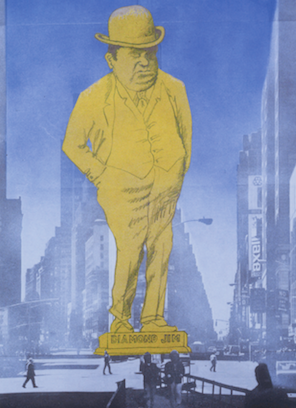 The poster introduced the site and jury, detailed the registration process, the schedule, and prize structure for cash awards, with the first place $10,000. 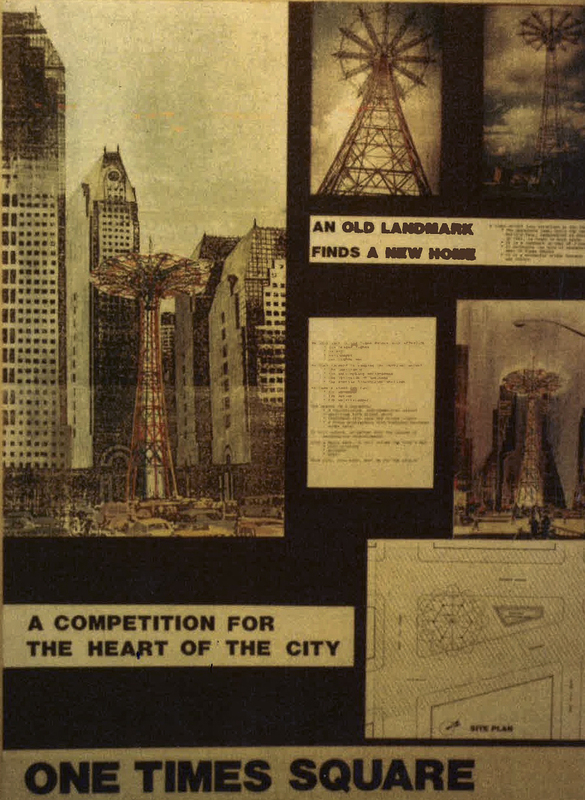 For whatever reasons - passion, prize money, publicity, fun, grades (many architecture school students entered) - the competition drew�an overwhelming 565 submissions that were�local, national, and international. 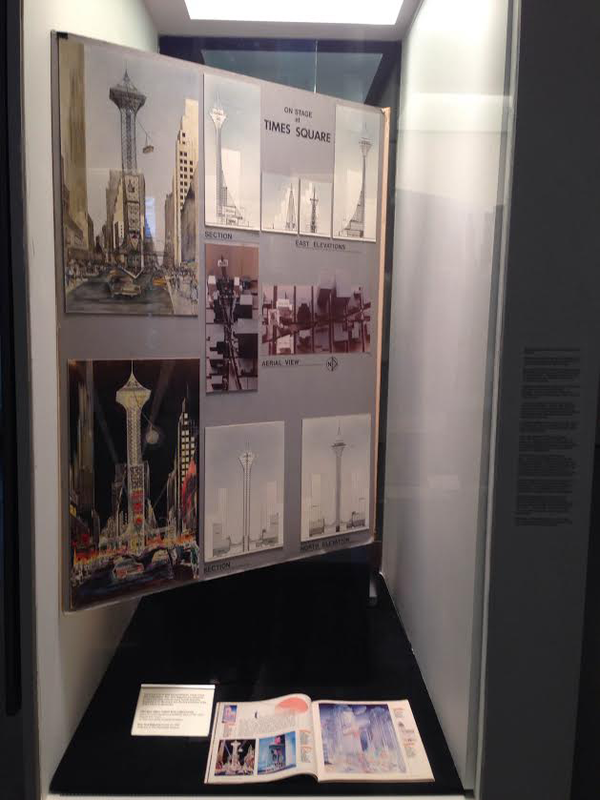 One of the winning entry boards, by David Stein, is displayed�here: Stein proposed to�recreate the�form of the old Times Tower as a giant screen of�light bulbs (it was 1984!) 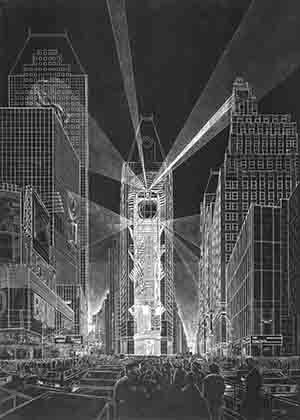 that would picture shifting images, including the original facade. 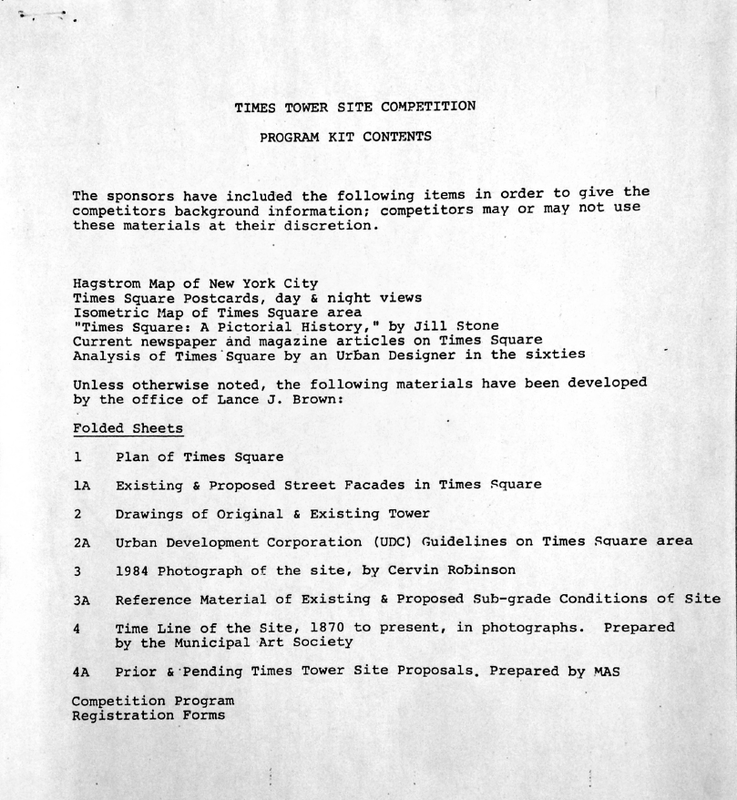 The gray folder in the case and the pale xerox page is the definitive sample of the official entry packet sent to each of the Times Tower Site Competition's 565 registered participants. 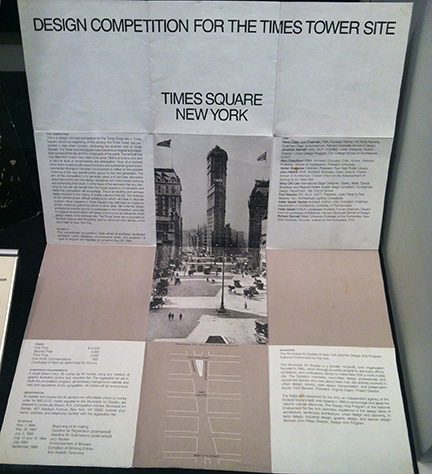 Compiled and saved by Lance Jay Brown, who served as the competition's professional advisor, the packet contained the guidelines for official boards; maps and photographs of the Times Tower and its surrounding area printed on oversized paper; postcards; newspaper articles; and a book on the history of Times Square. 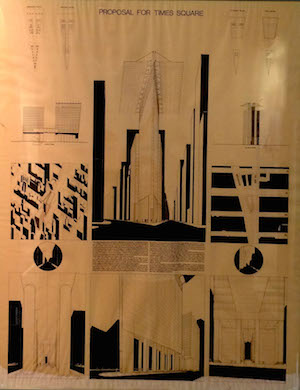 The jury consisted of nine members and was headed by Henry N. Cobb, founding partner at Pei Cobb Freed & Partners and Chair of the Architecture Department at Harvard's Graduate School of Design. 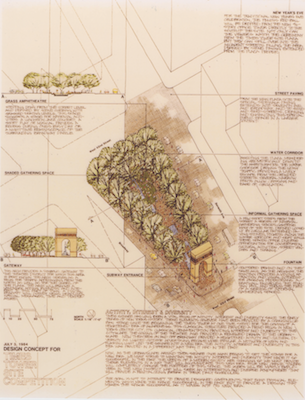 The remaining jurors were Jonathan Barnett, architect; Vartan Gregorian, historian; John Hejduk, architect; Ming Cho Lee, international stage designer; Adele Naude Santos, architect; Hideo Sasaki, landscape architect; Carl E. Schorske, cultural historian; and Richard Sennett, writer. 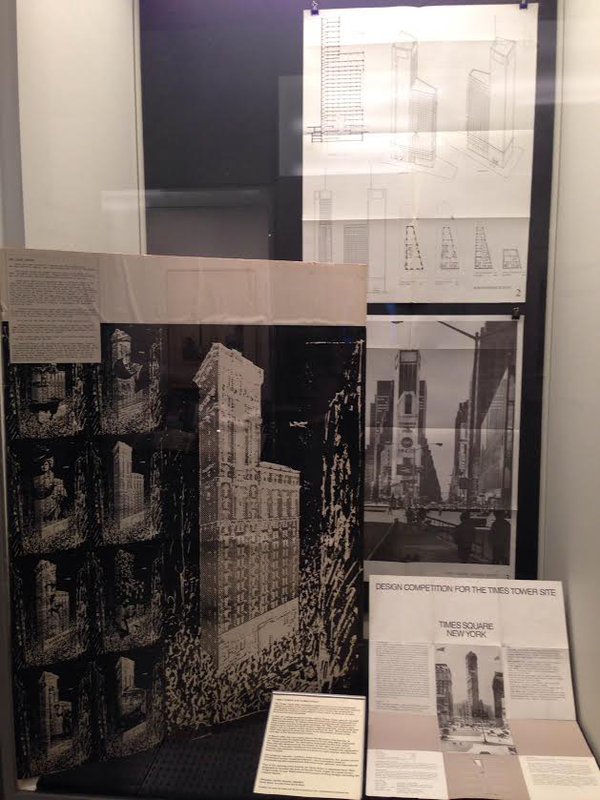 Installation Views: LEFT: Chip Sloan original entry board. 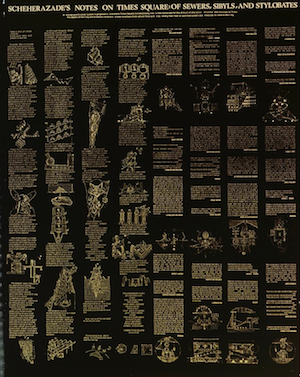 RIGHT: Jaime Gonzalez-Goldstein and Martine Maurin (1957-2007) original entry board. 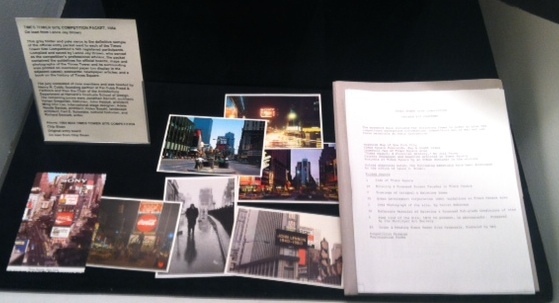 The MAS Exhibit at The Urban Center September 1984. Credit, Chip Sloan. 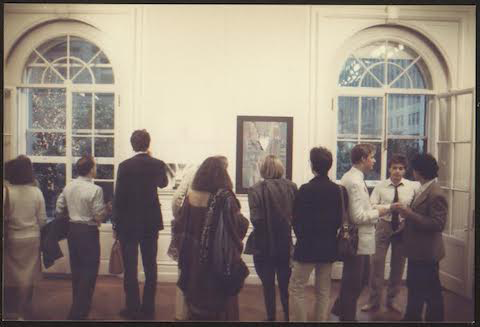 In September 1984, the winners and a selection of other boards were presented in an exhibition at the MAS's Urban Center gallery. 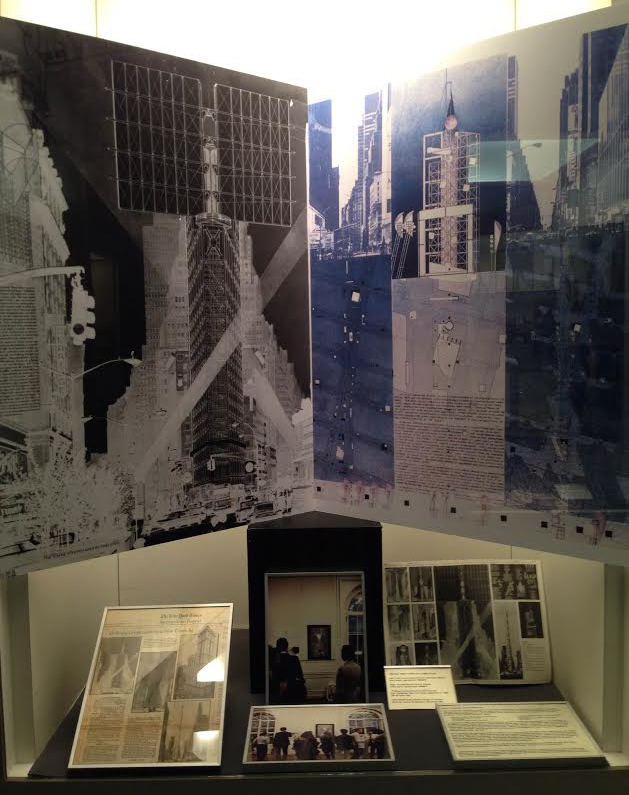 Photographs of the opening seen below were taken by Chip Sloan (whose board and baby in a basket are seen in the second photo). 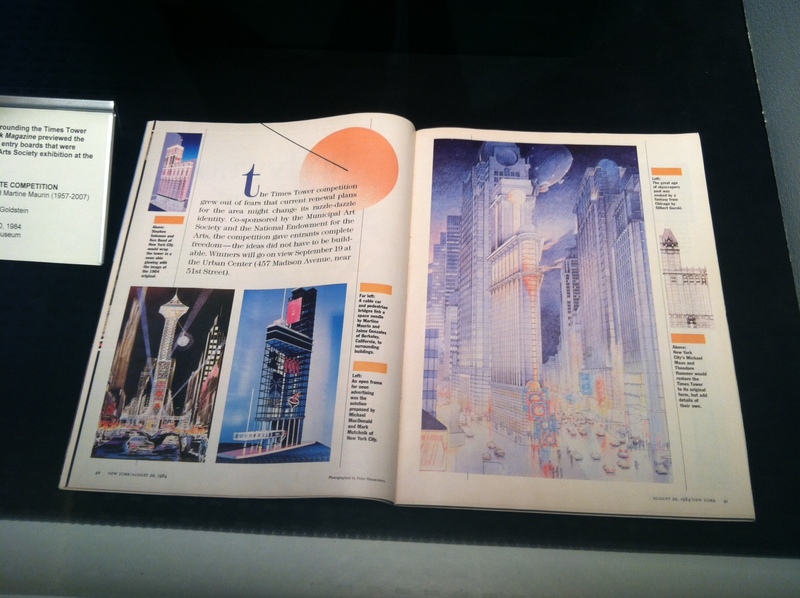 New York Magazine, August 20, 1984. 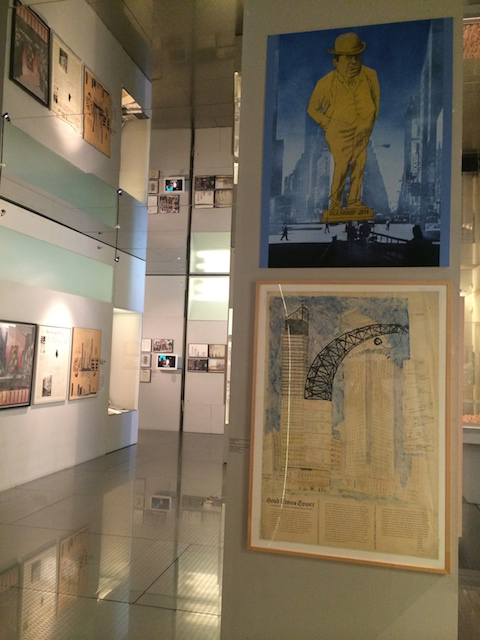 The article previewed the entry boards before the opening of the exhibition at the Urban Center. 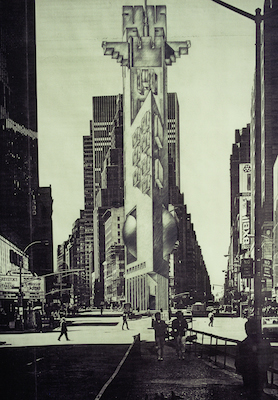 There was a lot of buzz surrounding the Times Tower Site Competition. 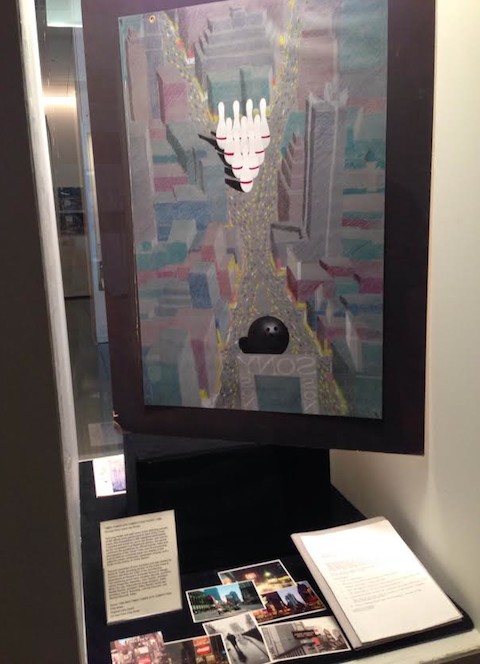 New York Magazine previewed the winners and other selected entry boards that were displayed at the Municipal Arts Society exhibition at the Urban Center in September. 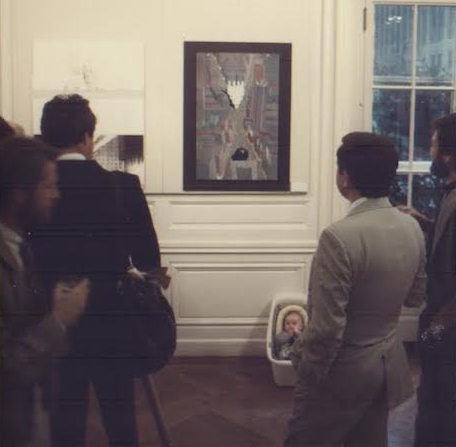 The MAS Exhibit at The Urban Center, with Chip Sloan's board and newborn in the background September, 1984. Credit, Chip Sloan. 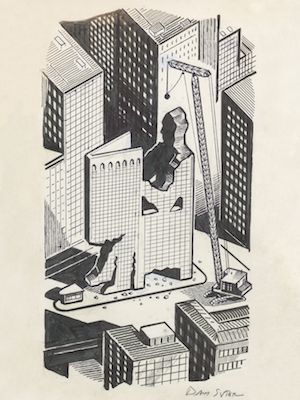 Oculus Magazine, vol. 46, no. 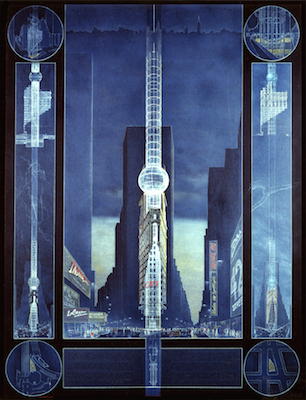 3, 1984. 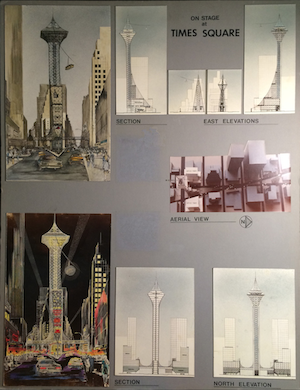 The MAS exhibit at the Urban Center was covered by Paul Goldberger in The New York Times, who wrote: "While the entries show a wide diversity, they all make clear the deep, almost passionate commitment of architects to Times Square's traditional, almost honky-tonk, identity." 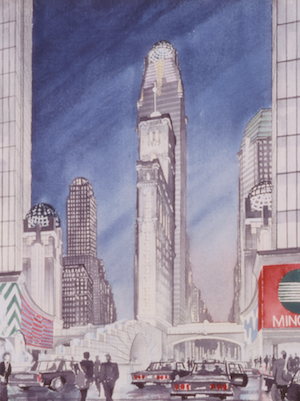 "Picking a Centerpiece for a New Times Square," The New York Times, September 17, 1984. 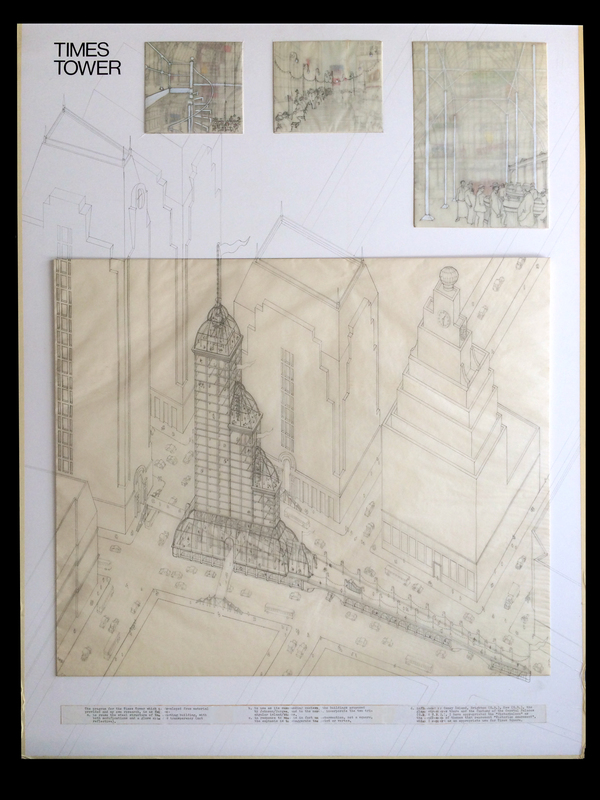 Our exhibition brings together two original winning boards (Dunnette and Stein) and reproduces five others from the artists' files. 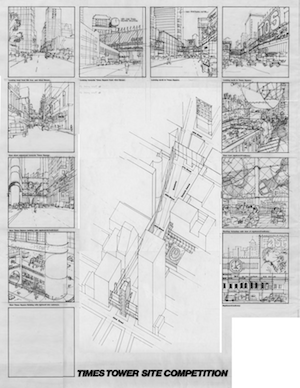 * Also presented here are original boards (shown at the Urban Center) by Rick Bell, et al., and by Chip Sloan, as well as two others preserved by their creators, Rodolfo Machado and George Ranalli. 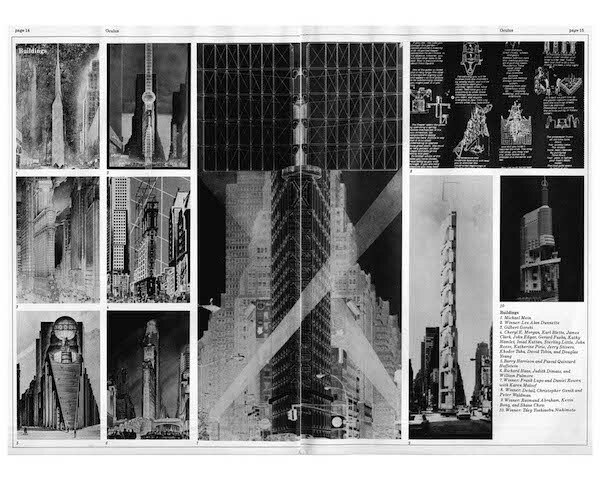 In all, The Skyscraper Museum was able to track down 21 boards or images to reunite for this exhibition.�They represent a cacophony of architectural directions, from poetic musings to irreverent one-liners, to theory-driven manifestos. *Unfortunately, the record of the full roster of entrants has been lost. 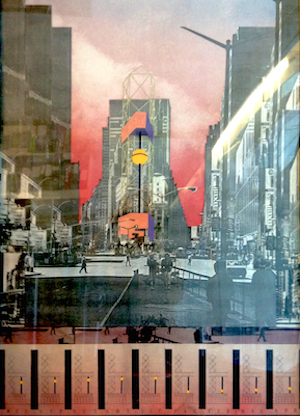 The boards were not returned to artists by the MAS, and after some time in storage at the Urban Center, they were water-damaged and discarded. 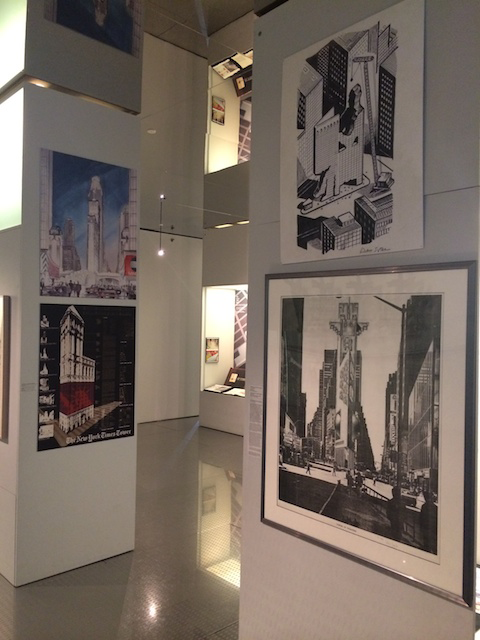 Three original boards reside in the museum collections: Lupo/ Rowen; and Abraham at MoMA: and Bentel/ Rusche at the Canadian Centre for Architecture in Montreal. 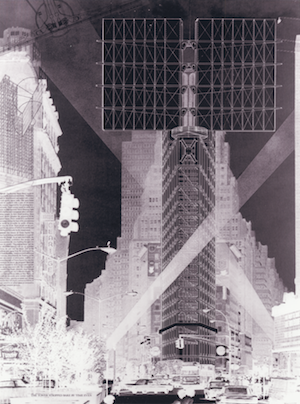 Credit: Peter Waldman & Christopher Genik; Raimund Abraham. 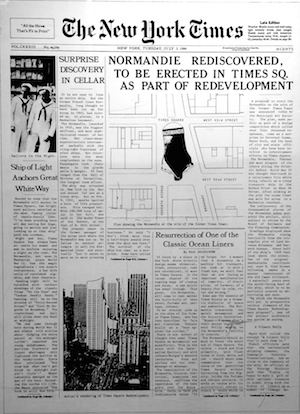 Photo credit The New York Times. 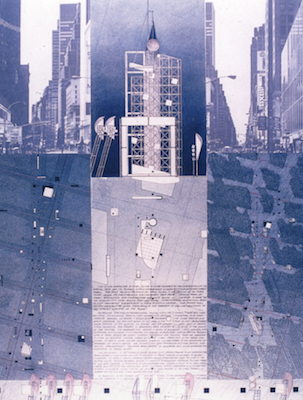 Image credit: Thomas Bitnar; Lawrence Stelter, Jeffrey Aronin, Judith Carroll, and Barry Goldsmith; Philip Tusa Architect. 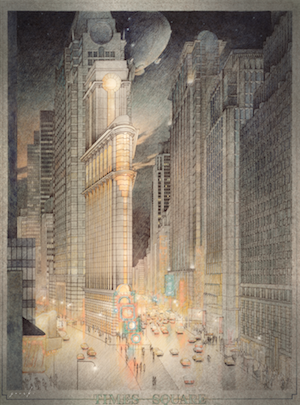 All photographs are provided courtesy of the artists, unless otherwise credited in the image captions and are protected by copyright. 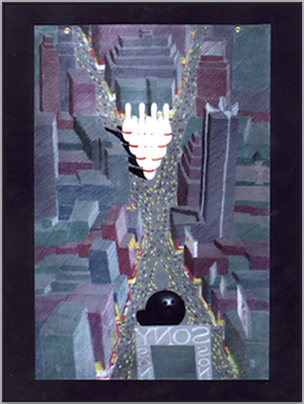 The original 30-minute film created in 1984 by Peter Bunche in response to the Times Square urban renewal and redevelopment proposals was produced as part of a community outreach project by Manhattan Cable TV. 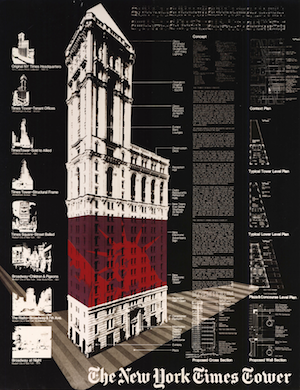 The excerpts shown here document the Municipal Art Society's Times Square Design Competition. 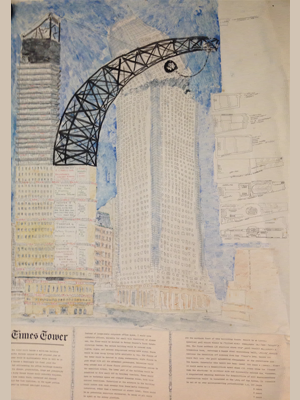 Some of the winning entries are explained by their creators including David Stein who proposed covering the Times Tower in programmable electric light bulbs.